Restore freshness to the skin with natural floral acids and Fleur’s Plumping Floral Bouquet. 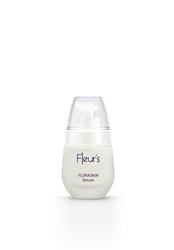 Fleur’s launches the newest anti-aging solution within the FLORASKIN collection, FLORASKIN Blossom Renewing Serum with Plumping Bouquet. Fleur’s floral bouquets are unique blends of botanical extracts formulated to have a synergistic action on individual skin conditions. Fleur’s Plumping Bouquet includes hibiscus and baobab flowers to lift slackened areas of the face and restore youthfulness and plumpness to the chin and cheekbones. Fleur’s Lifting Bouquet does just as its name implies, filling wrinkles and boosting collagen synthesis for smoother, firmer skin, while giving the face a younger, “lifted” appearance. As sensory as it is effective, this water-in-oil serum features floral acids to stimulate cell renewing while leaving a soft, floral scent. Light Reflector Pigments instantly brighten skin, blurring fine lines for a beautiful look and feel. Directions for use: apply to the entire face and neck, morning and evening prior to a day or night cream. Plumping Bouquet - features hibiscus and baobab flowers. Stimulates cell metabolism to plump slackening skin and reduce facial sagging. Plumps the cheeks to reshape the face. Flower Acids - stimulates cell renewal to improve skin texture. Light Reflector Pigments - blurs fine lines to instantly brighten the face. *Clinical scoring performed on 24 volunteers, after 28 days of twice daily application..
Fleur’s, literally meaning “flowers,” draws its inspiration and actives from the beauty and power of the floral universe, the splendor and expression of art and ultimately the inexhaustible possibilities of science. These passions are synergistically combined with aromachology, fruits, minerals, floral waters and organic ingredients to create an effective and sensorial skin care line. Fleur’s focus is blending effective treatments with a true spa experience in every facet - unique and imaginative treatments and techniques. We are one of the only spa brands with our own laboratory, allowing us to research and cultivate our own ingredients, develop unique cosmetic formulas, manufacture skin care products and create cutting-edge professional treatments to deliver remarkable results.